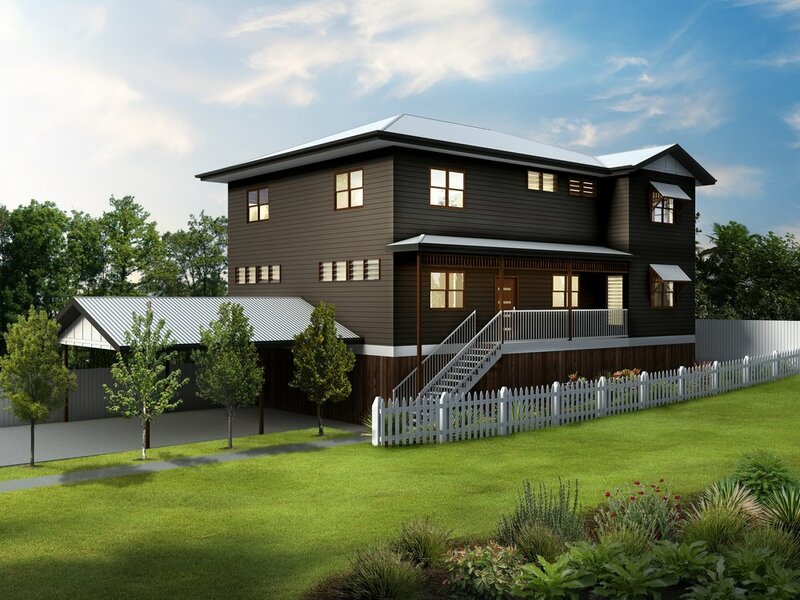 This five bedroom family home is of a more traditional Queenslander style layout and is modelled on a renovation project from a past client. The front facade of the home keeps to Queenslander tradition by having a short flight of stairs lead up to a small front porch area. There is the option of a two car carport but this home has no garage. On entering the home you have a small two way office to your right and a long living and dining area to the left. To the right of the living and dining area is the good sized kitchen. While being in a separate room, the design of the bench space allows the kitchen to feel open to the rest of the home. With the kitchen being central to the home, this effectively splits the lower floor into two distinct wings - the left wing being the living and dining area. The right wing includes the fifth bedroom which would be perfect for a guest bedroom, a combined laundry/bathroom and a separate rumpus room. Completing this floor of the home is the outside alfresco with access from both the rumpus room and dining room. Heading upstairs to the first floor you will walk into a central kids retreat/third living room. Surrounding this is four bedrooms all with built in wardrobes and with bedroom one having access it its own private ensuite. A large family bathroom completes this floor.